LONDON (Reuters) - British Foreign Secretary Jeremy Hunt on Tuesday condemned an attack on a BBC cameraman by a supporter of U.S. President Donald Trump at a campaign rally in El Paso, Texas. Asked on Tuesday by Sky News whether it was acceptable for Trump to whip up his fans to the point that a cameraman was attacked, Hunt said: "It is never acceptable when journalists and cameramen are attacked just for doing their job." Wearing a "Make America Great Again" cap, a man was seen shoving BBC cameraman Ron Skeans before being pulled away on Monday, according to a BBC video. Trump has frequently attacked the news media for what he views as unfair coverage, decrying some outlets as peddlers of "fake news" and "enemy of the people." News outlets have pushed back, with New York Times publisher A.G. Sulzberger joining others in saying that Trump's language has increased the prospect of journalists facing violence, both in the United States and abroad. "There is a broader issue here which is that last year 80 journalists were killed across the world just for doing their job," Hunt said. "We are very worried about this." The White House News Photographers Association condemned the attack and said the White House, the Secret Service and local law enforcement should do more to protect journalists at Trump events. Skeans is a member of the association. "Furthermore, given that the president's rhetoric about journalists is too often false and derogatory, we ask that he refrain from unnecessarily targeting journalists with his speech since such rhetoric may be inciting violent acts such as this one," the group said in a statement. White House spokeswoman Sarah Sanders said in a statement that Trump "condemns all acts of violence against any individual or group of people - including members of the press. We ask that anyone attending an event do so in a peaceful and respectful manner." 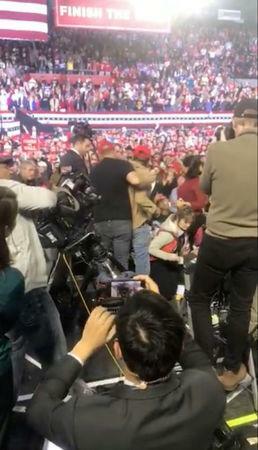 The BBC reported that the Trump supporter pushed Skeans and cursed at him during the rally. It published video of the encounter that ends with the supporter being restrained and moved away from the media area. "Are you alright?" Trump asked after seeing the encounter, giving a thumbs up to the cameraman. "Everything OK?" The BBC said it wrote a letter to the White House asking for a "review of security arrangements" for media covering Trump's rallies. Skeans suffered no lasting harm, the BBC said. The Committee to Protect Journalists also criticized Trump. "It's outrageous that a journalist was attacked while covering a presidential speech," Alexandra Ellerbeck, the nonprofit organization's North America program coordinator, said in a statement. "We call on President Trump to moderate his rhetoric against the press and to state clearly that physically attacking media personnel is not acceptable."